Last year we took a look at the book LEGO Eisenbahn – Konzepte und Techniken für realistische Modelle by Holger Matthes (HoMa here at Brickset), We enjoyed looking at the pictures and instructions but couldn’t really review it because the text is in German. 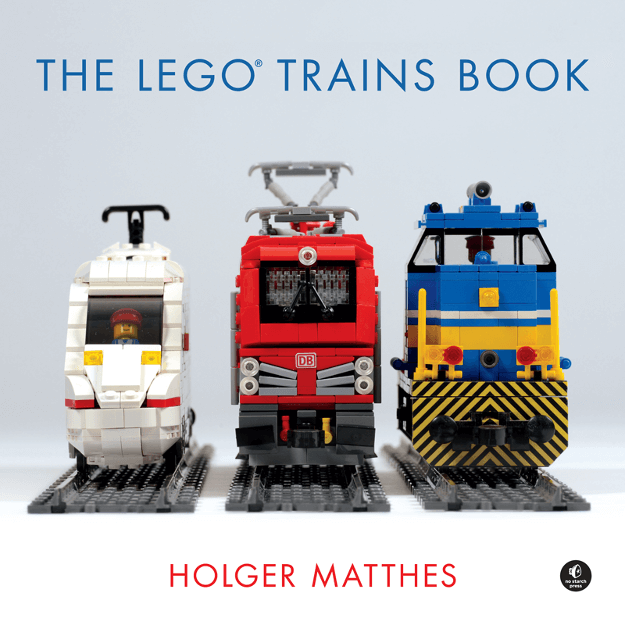 Since its publication Holger has been busy working on an English translation and the result is The LEGO Trains Book, published by No Starch Press. Holger is one of the most respected builders of LEGO trains in the world. He was involved in the design of the Hobby Trains set 10183, and he and I participated in Power Functions train workshops in Billund in the late 2000s that resulted in the release of the Emerald Night, so you can be sure that he knows what he’s talking about. Starting with the 1960s-1970s blue track era, right up to the current Power Functions era, Holger discusses every aspect of the different systems, the track, the power system, specialist elements such as wheels and couplings and also takes a look back at them from today’s perspective, highlighting their strengths and weaknesses. The book is aimed at everyone from the complete LEGO novice upwards so a short chapter on the basics of the LEGO System, elements, connections and building techniques is included. Although it starts off covering what you’ll already know, it ends with advanced techniques for SNOT, ‘off the grid’, building in odd dimensions, micro-striping and texturing: techniques that are commonly used when building trains. Many books provide instructions for models but few actually cover how to go about designing your own. This chapter will help you translate your ideas into a LEGO model, starting with deciding what scale to build it in and ending with how to model realistic details such as roofs and corridor connections. This section covers how Holger went about designing models of real life trains; in other words, putting the basics in to practice. Case studies include the Siemens Vectron electric locomotive (shown in the middle on the cover) and BR10 steam engine. The latter is particularly interesting because he discusses how his model has developed over time, since first building it in 2001, as new parts become available and new techniques are discovered. Layout and presentation are excellent and one would have no problem following them. A bill of materials is provided for each allowing you to assemble the parts before commencing building. Instructions for the BR10 and a BR80 steam locomotive are available online, via links on the No Starch website. This is a very comprehensive book, illustrated with excellent photographs and diagrams. It covers every aspect of LEGO trains, written by a subject matter expert who has successfully distilled his years of experience into the pages of it. Whether you’re just starting to think about getting into LEGO trains, or you’ve been building them for years, you’ll find a lot of interesting and informative information within it. I can’t really find fault. The only criticism I can make is that the examples and instructions are mostly based on mainland European trains and rolling stock which are very different to those in the USA, UK and elsewhere. However, armed with the tips and techniques used to design and build them you’ll be well placed to tackle local prototypes. Thanks to No Starch Press for providing a copy for review. The review is an expression of my own opinions.